Whipped…lashed within an inch of His life. Slapped…beard ripped from His face. Bound…nails pounded into His flesh. Ridiculed…garment gambled for at His feet. Pierced…in His side, and in His heart. Now, it is time to bury Him. But who will take Him down from the cross? 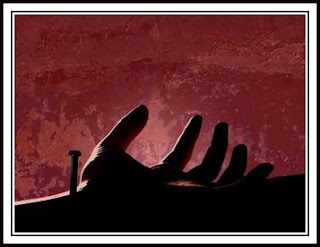 Who removed those gruesome nails from Jesus’ body? Evening approaches. Clouds blush in the western sky as the sun begins to slide into the distant hills. It’s Preparation Day, the day before Sabbath. A somber atmosphere hangs heavy in the city. Hearts sting from the ghastly sight of Jesus body being nailed to a cross as a common criminal. But now, who will take down His body? He must be buried. Appearing with boldness before Pilate to ask for the body of Jesus is Joseph of Arimathea. A rich man. A prominent member of the Sanhedrin. A secret follower of Jesus waiting for the kingdom of God. What? Pilate summons the centurion. Jesus is dead? Pilate asks. The centurion replies in the positive. Pilate then gives Joseph permission to take Jesus’ body and bury it. The day is growing short. Joseph rushes to the market for some linen burial cloths. Nicodemus joins him, helping to carry one hundred pounds of burial spices. Hearts throb while lungs heave in their chests as the two men flee toward Golgotha. Joseph takes a deep breath. Remove the nails? How can I do this? Tears of deep grief fill his eyes and spill onto his cheeks. With trembling hands, Joseph extracts the bloody nails driven for the sins of man. First, from Jesus’ feet. He finds a nearby ladder and timidly climbs up. He releases the cords of hate that tied Jesus’ wrists to the offensive cross beam. Next, he struggles to remove the nails…from one hand, then the other. The Savior’s lifeless body plunges into the arms of Nicodemus. Kneeling beside Jesus’ body, the men delicately wrap each linen strip with the spices around His body. Their arms and legs strain from the weight as they then carry Jesus to a newly hewn tomb in the garden. After laying His body inside, the men back out of the tomb, bowing in reverence. Joseph rolls a large stone against the entrance of the tomb. The men walk back to the city in silence. It is finished. Or is it? Standing over the blistering heat of the fire, as sweat trails down his dirty face, the smith fans the blazing flames with his bellows. Finishing the hammer he is working on, he checks it thoroughly, making sure it will meet the critical eye of the centurion. All his work as a smith for the Roman army must pass inspection before it goes into the hands of the soldiers. After the centurion picks up the ready tools from the smith and approves them, he sets out to deliver them to his soldiers. On his way, he gives the hammer to one of the best soldiers under his command. The soldier’s use of the hammer this day? Crucifixion duty. The soldier has endured the burden of this duty before. He hates this gruesome task. Under the strain of this assignment, he ambles his way to skull hill, better known as Golgotha, where he joins the centurion and the three other soldiers already there. Standing there chatting with them, he hears that three prisoners are coming to be crucified. One of the prisoners is his charge. He waits. Impending gloom hangs in the air. A large, jeering crowd, intermingled with a great many mourners, moves toward the hill on the Via Dolorosa. Two men bent under the weight of their own crossbeam trudge their way up the hill. A short distance behind them stumbles another man, whipped beyond recognition and staggering in agony. So disfigured and injured is He that one of the soldiers commands another man to carry the crossbeam for Him. This bloodied mess of a man now stands before the soldier in charge of Him. The soldier wonders: Who is this man? What could he possibly have done to deserve this horrible beating? Surely, he wasn’t a soldier for he wears no hobnailed boots; he’s merely an ordinary sandaled man. Sweat beads up on the soldier’s forehead. His heart races. His tongue sticks to the roof of his mouth. The other soldiers help tie the soldier’s prisoner to the crossbeam while the soldier readies his nail-spikes and his hammer. He bends down, steadies the nail in one hand and draws back his hammer in the other hand. But before he can bring it down on the nail, he glances over at the prisoner. Peering at him, through streaks of blood covering His face caused by a thorny crown twisted onto his head, are eyes of piercing kindness he has never seen before. The centurion yells the soldier’s name and orders, “Get on with it!” Startling the soldier to remember to breath. The soldier turns his head away to focus on the nail. He forces himself to bring the hammer down. His stomach churns and he feels like retching. Completing the nailing of this man to the crossbeam, he looks down to see blood splatters covering his uniform and the red life of the man dripping from his hammer. The soldier realizes now who this man is. Jesus. This is Jesus, the one everyone is talking about. Forgive? How can He forgive me for this horrid act? Later, the soldier hears, “It is finished! 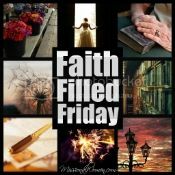 Father, I commit My Spirit to You.” And the man Jesus breathes out His last breath. The centurion orders the soldier to stand guard. Stand guard? I just want to get out of here. So distraught that he cannot bear to look up at the naked body of this man on the cross, he lowers his eyes to the ground. He notices the bloody hammer still in his hand. He throws it down and backs away in horror. Shame overwhelms him. He falls to his knees in regret. The next morning, the centurion finds the soldier dead. ~The hammer that dripped blood? Had my name engraved on it. ~Thank You, Lord, for without Your suffering and death on the cross, I would have no resurrection joy! They want to leave it all behind; take the road out of it all. So, the two men depart from the hills of Jerusalem to get away from all the reminders of a heartrending crucifixion on the hill of Golgotha. Just as the road slopes down from Jerusalem, so their souls now slope down, reeling from dashed hopes of an empty tomb. With the Sabbath now past, the two men somberly amble their way to the village of Emmaus, just a little more than seven miles away. One would think that the crisp, clear sky, the warm afternoon sun, and the aroma of spring buds in the air would revive their souls. Not so. In their attempt to leave behind the pain and disappointment, they find they yet carry the heartache with them: the lashings of punishment strike at their emotions; the nails of hatred pierce their hearts; the thorns of a mocking crown penetrate their thoughts. Numb from it all, Cleopas and his friend stroll along the way discussing the dreadful events of the past few days and try to make sense of it all. They abruptly stop. A look of bewilderment blankets their faces. “Are you a stranger in Jerusalem? Do you not know the things that happened there these last three days?” asks Cleopas. They recall to the stranger all the anguish: the judgment, the whipping, and the crucifixion of an innocent man named Jesus. The stranger attempts to rekindle their embered hopes by quoting them the prophets, starting with the book of Genesis and going through the Scriptures, explaining what they meant. Listening so intently to what the stranger says, the men do not realize they have reached the outskirts of the town. The man acts as if he is going on but they beg him to stay. Agreeing to go with them, he joins them as they head toward their lodging place. As they sit down at the table for their meal, the man takes the bread, blesses it and breaks it, giving a portion to each one. Suddenly, the veil of obscurity vanishes from their eyes and they recognize him! It is Jesus Himself! And at that moment, He disappears from their sight. “It was Jesus! It was Jesus!” they both shout. So exhilarated, they begin to remind each other of their Emmaus walk, “Didn’t our hearts burn as He talked with us along the way and opened up the Scriptures for us?” Grasping it all, their hearts blaze again with the Emmaus heartburn. And so it is with us as we travel the road of life and leave behind the pain not only of the past at the foot of the cross but also of the tomb emptied of hopes and dreams, for our hearts cannot stay at the site of death and resurrection. We must take that daily, life-road walk, and, as we do, we find Jesus walking with us in fellowship every step of the way. As we walk with Him, talk with Him, invite Him to be our guest, and spend time with Him, sharing the Bread of the Word, the true unveiling comes, and, we have a celebration of revelation. May your heart be set ablaze with His presence, as with the Emmaus heartburn. Standing over the blistering heat of the fire, as sweat trails down his dirty face, the smith fans the blazing flames with his bellows. As he finishes the hammer he is working on, he gives it a thorough check, making sure it will meet the critical eye of the centurion. As a smith for the Roman army, all his work goes into the hands of the soldiers. After the centurion picks up the ready tools from the smith and approves them, he sets out to deliver them to his soldiers. On his way, he gives the hammer to one of the best soldiers under his command. The soldier’s use of the hammer this day? Crucifixion duty. The soldier has endured the burden of this duty before. He hates this gruesome task. Under the strain of this assignment, he ambles his way to skull hill, better known as Golgotha, where he joins the centurion and the other three soldiers already there. Standing there chatting with them, he hears that three prisoners are coming to be crucified. One of the prisoners is his charge. Standing there, he realizes that what he is about to do is the antithesis of the weather: it is one of those breathtaking, spring days that warms and rejuvenates the soul. Rivulets of white stream across the azure sky. A gentle breeze distills the fragrance of the flowering blossoms into the air. Yet, impending gloom hangs in the air. A large, jeering crowd, intermingled with a great many mourners, moves toward the hill on the Via Dolorosa. Three men bent under the weight of their own crossbeam trudge their way up the hill. A short distance behind them is another man, whipped beyond recognition, stumbling with agonized effort every step of the way. So disfigured and injured that another man carries his crossbeam for him. This bloodied mess of a man now stands before the soldier. He wonders: Who is this man? What could he possibly have done to deserve this horrible beating? Surely, he wasn’t a soldier for he wears no hobnailed boots; he’s merely an ordinary sandaled man. The other soldiers, now finished crucifying their two prisoners, help tie the soldier’s prisoner to the crossbeam while the soldier readies his nail-spikes and his hammer. He bends down, steadies the nail in one hand and draws back his hammer in the other hand. But before he can bring it down on the nail, he glances over at the prisoner. Peering at him, through the streaks of blood covering his face from the thorny crown twisted onto his head, are eyes of piercing kindness he has never seen before. The soldier turns his head away to focus on the nail. He forces himself to do the job he was ordered to do. His stomach churns and he feels like retching. Completing the nailing of this man to the crossbeam, he looks down to see that he is splattered with blood and his hammer drips with the red life of the man. “Today, you will be with Me in Paradise.” Bowing His head, Jesus says, “It is finished! Father, I commit My Spirit to You.” And He breathes out His last breath. “Surely, this was a righteous man,” says the centurion, shaking his head, and then solemnly orders the soldier to stand guard. Stand guard? I just want to get out of here. What have I done? So distraught that he cannot bear to look up at the naked body of this man on the cross, he lowers his eyes to the ground. He notices the bloody hammer still in his hand. He throws it down and backs away in horror. Another soldier picks up the hammer and tries to give it to him. “Here’s your hammer” is met only with silence and a stare. He won’t touch it. ~~In my joy, I agonized over this post. I know you understand why. Christianwriters.com on the topic of Joy. Please visit the other participants listed in the right sidebar. Learning a trade from a father was essential. A tradition of following in a father’s footsteps. And so this young man obeys. In the humble beginning of his apprenticeship, he is learning from his father to carve out the design of the wood, to slide his hands across the wood and feel the grain, and to carry stacks of wood. Still a young lad and learning his trade, he needs the direction of his father’s callused hands to guide his unskilled hands, which now need a little rest. Stepping away from the carpenter’s bench, he walks outside the shop to take a break from his work and stretch his back. Standing in the warm, noon sun, he picks at another of the daily splinters in his hands, as the rhythm of the hammer pounds in the background. Extending his arms toward the sky, he says a prayer of thanksgiving to God the Father. He breathes in fresh air to rid his nostrils of sawdust. First shaking his head to dislodge more sawdust tangled in his hair, he then removes his sandals and shakes out the wood shavings. As the sun’s warmth soothes his aching muscles, he wonders when he first loved the savory aroma of wood. From the stories his father has told him, he decides the first whiffs seeped into his memory from the wooden trough at his birth. 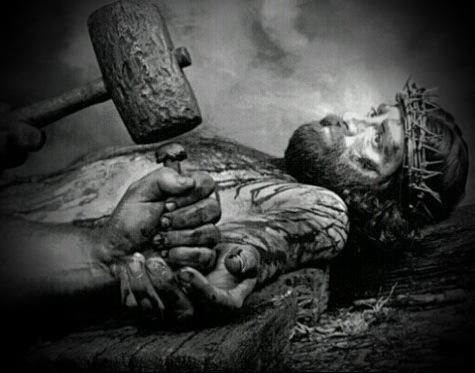 When would Jesus realize all these things were harbingers of agony upon a wooden cross? Did that dreadful day of agony revive all those fragrant memories of His childhood? What did those harbingers herald? * Stepping aside from His carpenter’s life means stepping into His glorified life. * The sawdust that clung to His hair is now exchanged for a crown of thorns encircling His head. * Stretching His sore back could never compare to the excruciating pain from the flesh-revealing stripes received from a scourge. * The removing of His sandals rid them of sawdust; now removing them reveals His feet for torture. 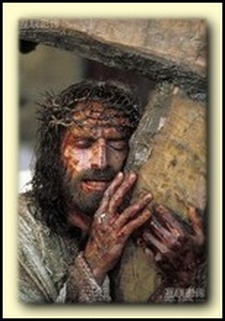 * The wood He once carried strengthened Him to carry a cross-beam along the Via Dolorosa. * His hands, once suffering splinters from pressing against the grain of the wood, now feeling pain as shards puncture them from bearing the weight of the wooden cross-beam. * The hammer that pounded in the background now pounds in rhythmic timbre upon the nail heads, piercing His hands. * The memory-scent of the wood, embedded in His nostrils, infuses His soul as the punctured wood releases that familiar fragrance. * The fresh air He so easily breathed in now barely makes it into His nostrils as He struggles to breathe. * His muscles that ached from work now throb from the pain of crucifixion, which no soothing sun can ever relieve. * His arms extended once again…in prayer to His Father. Following His heavenly Father’s guidance, this young Man obeyed…unto death. The scent of the wood released from obedience. A sweet aroma to the Father.